It has almost been one year since we introduced the widely accepted Visual Invoice templates system into Studiometry. We’re taking this great feature and expanding the capabilities for Studiometry 5.0. Users will now be able to create Visual Report templates using the updated WYSIWYG editor, giving the flexibility of the Reports features combined with the easy to use Visual Template editor. In addition, Visual Invoice and Report Templates now have multi-page capabilities. Templates can easily have a cover page, or a specific page that repeats with new items until the Invoice or Report has been completely generated. Each page can then be previewed, exported individually, or printed as a whole. 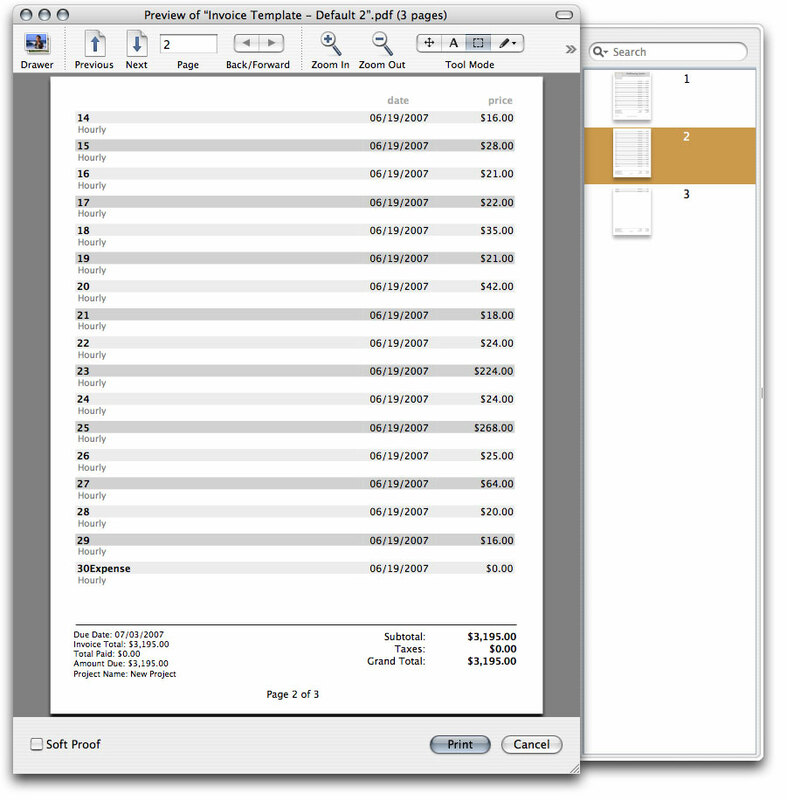 Printing multi-page Visual Invoices and Reports is a standard one-click process. Studiometry automatically calculates how many lines of items fit onto each page based on the sizing of your data columns, and then produces the correct amount of pages until all items have been shown. We’ve also added a few things to the Code-Based template viewing and printing. Multi-Page Code Based Templates can now be printed directly from Studiometry, and thanks to updated plug-ins, a few long-standing print display issues have been resolved. Code-Based previewing and printing remains a Mac-Only feature. The addition of these new features greatly expands the power and flexibility of Studiometry, giving the end user even more control over the output of the program. Studiometry 5.0 is slated for a late Summer 2007 release, however the Beta Program registration will be opening soon. Also, be sure to keep an eye on the Studiometry Blog for more sneak peaks at upcoming Studiometry features! Studiometry 4.1.5 is a free update for all registered Studiometry 4.x users. This update is a performance patch, dramatically increasing performance in two parts of the program. Loading a Visual Invoice Template for editing, or generating a Visual Invoice for a customer will now be approximately 95% faster on all machines. This translates to less than one second on most machines to load most Visual templates. The second area focused on in this release is network syncing. Studiometry will now connect to and sync with a server anywhere between 80% to 97% faster (based on our tests) after the very first initial sync with a server. Both of these performance increases were created and implemented into the program as a free update for all registered Studiometry 4.x users, and serve as a precursor to the upcoming Studiometry 5. Studiometry 4.1.5, which will be released sometime early next week, features drastic performance improvements to two areas of the program. We’ve been spending much time working improving the performance of Studiometry 4.x to prevent users from feeling “forced” into upgrading to Studiometry 5 when it is released simply for performance reasons. As you can see, these are very large speed enhancements, which can be noticed even on machines that didn’t take very long initially to sync. Please note, however, that performing a manual full sync (Networking Menu > Sync Now) will still take longer than desired on some machines, simply due to the fact that every item must be sent to and then back from the server. These syncs will still be faster, but not nearly as fast as the initial syncs. We’ve also gotten feedback from users regarding sluggish loading of Visual Invoice Templates for editing templates and generating Invoices. After spending much time optimizing the code for loading and viewing the Visual Templates, we can now say there are equally drastic performance improvements in this area. The templates, even complicated templates, now load near-instantly on almost all machines. Studiometry 4.1.5 also features several other small bug fixes, mainly related to Windows specific issues. Studiometry 4.1.5 will be a free update for registered users of Studiometry 4.x, and will be available for download early next week. One of the main areas of Studiometry we are overhauling for our next major release is the ability to summarize and export large amounts of customizable data. Currently there are many great ways of doing this already in the program, including the current Invoice/Report templates systems, the current exporting abilities, and the vast amount of printable lists and sections. There are some situations, however, where the current features just don’t cut it, and we’re working on a great solution based on your customer feedback to solve this problem. The new Summary features we have been developing are very powerful and flexible, yet require no programming or coding knowledge. These new features allow you to create and print powerful reports based on customizable filters, sorting behaviors, available fields, and more. They provide a great way to easily summarize and display large amounts of information quickly and elegantly. 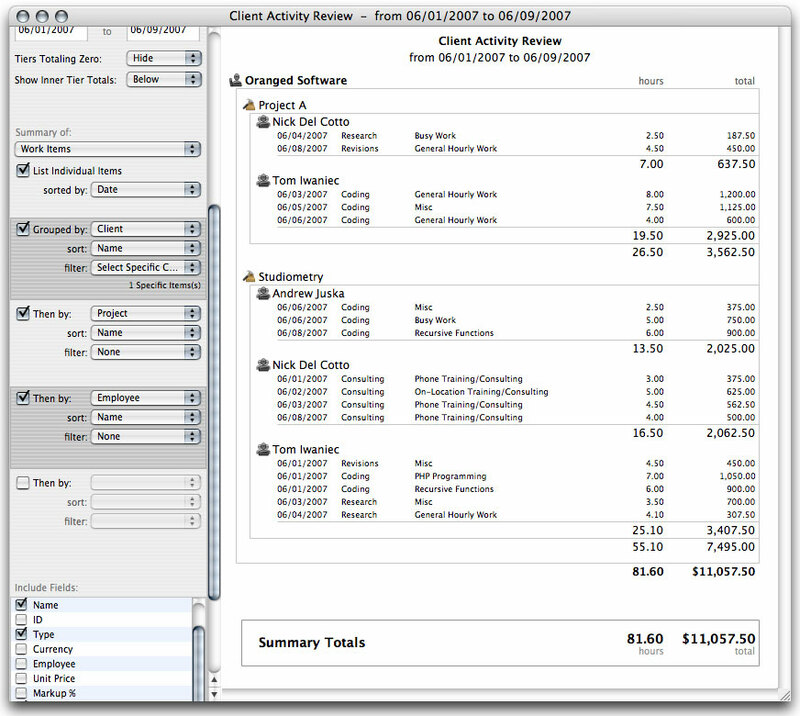 Click on the screenshot for a full view of this hypothetical Client Activity review of recent work done for a Client, summarized by Project and Employee. As you can see, the hierarchal controls on the left allow you to set up exactly how the report is sorted, filtered, and formatted. We feel this new feature will have countless uses for the majority of Studiometry users. Studiometry 5.0 is slated for a late Summer 2007 release, however the Beta Program registration will be opening soon. Also, be sure to keep an eye on the Studiometry Blog for more sneak peaks at upcoming Studiometry features! Studiometry 4.1.4 is a small patch fixing several minor issues and adding improved syncing speed as well as an additional Invoice/Report template tag. This is a free update for all registered Studiometry 4.x users.